Niagara Conservation talks Greenbuild, KBIS and its new look for 2018. Niagara Conservation Corp has been tinkering around since 1977, when founder Bill Cutler developed the first Niagara showerhead aimed to tackle the question: “Why should anything be so wasteful?” Forty years later, the company supports the same message and aims to own a space it, in many ways, created. We connected with Niagara Conservation at Greenbuild 2017 in Boston and talked a little bit about the company’s new look for 2018, which will be announced at KBIS this January. Bradly Egan, director of marketing, gave us a little peek at what this new year will look like. Sarah Cimarusti (SC): In light of recent and upcoming shows — Greenbuild, IBS, and KBIS — this month we are focused on kitchen and bath trends. What are some trends and highlights you have been focusing on? Bradly Egan (BE): Trends that we’ve been seeing have been a lot more aimed toward the health side. And we’re also seeing an increased awareness in conservation in general. We field a lot of questions on the fly about how people can reduce their water bill. Homeowners worry about the dollars, and property managers are looking for ways to reduce operating expenses. We see a lot of demand building up around these kinds of products. One product that will be on display during KBIS will be the Nano. We developed the Nano to require a much smaller footprint while still offering the comfort of an elongated bowl. 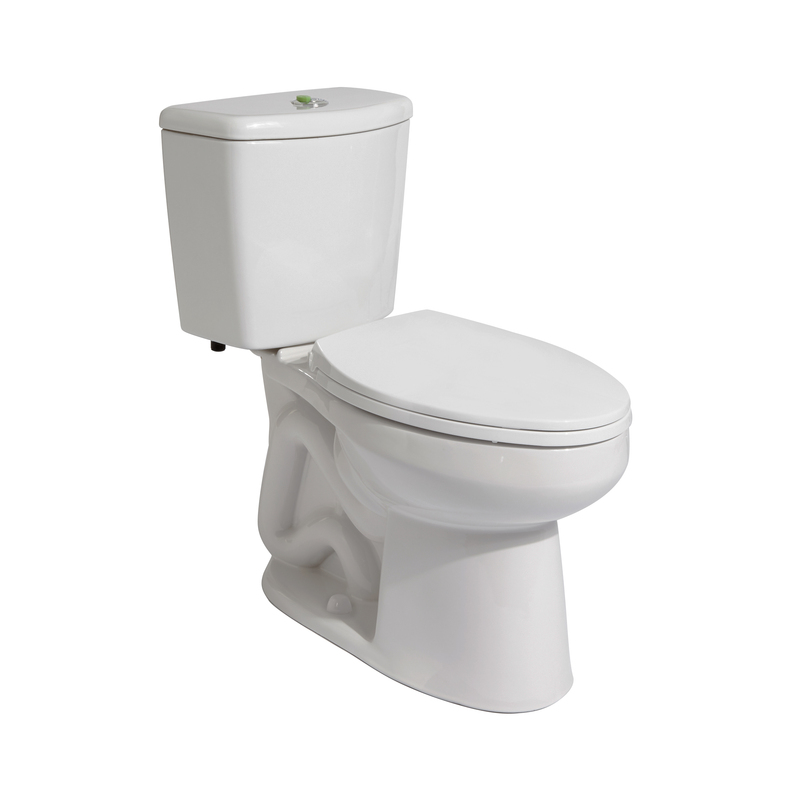 It’s our most efficient toilet yet; it flushes at an even lower rate — 0.5 for a half-flush and 0.8 for a full-flush. It’s a perfect product for us to push out right now. The Stealth Phantom, which was showcased at Greenbuild, has the same tank design as the Nano, and features our Stealth technology with both single- and dual-flush options. So, you have an interchangeable tank, which can turn our single-flush Phantom into one of the most efficient, dual-flush conservation machines that’s out there for your bathroom. If there is a situation where you only want the single-flush, you’re still hitting that 0.8 gallons every single flush, every single time. So, both toilets will be on display at KBIS 2018, which is very design-focused. The Phantom’s modern silhouette fits very well into that realm, and while our Nano is more functional and more about efficiency over high-end design, its compact sleekness makes it a great addition to smaller bathrooms. Our HealthGuard Showerhead will also be featured at the conference; it saves up to 40 percent more water and has an antimicrobial coating that prevents bacterial growth and a removable faceplate that makes it super easy to clean. It’s also a pretty good-looking fixture and fits into most spaces. So, it looks good and serves a purpose. This is something we pride ourselves here at Niagara — being a conservation- and innovation-minded company that’s not interested in just building something that’s beautiful. We start with functionality and build up from there. SC: You’ve been experimenting with the technological side of your showerheads. Would you care to discuss the progress? BE: We are “tinkering” with things from new hand controls for easy use to digital readouts to LED lighting, to get people to know what’s going on in the shower. Our current Hotstart showerhead will shut off once it hits a certain temperature, so when you’re ready to get into the shower, you can hit the resume feature. We are looking to put together a new version of this particular showerhead, but we’re still in the prototype phase. We’re looking to bring that out here in about six months. SC: Can you give us a little idea of what goes into your design research and process? What inspires everyone as a team? BE: Everybody in the company has a little bit of a say in that. There’s not just one person who comes up with great ideas; it’s a whole crew of us. We have a product development process that allows people in the company to submit their ideas, and it runs through our process of vetting. I have worked with a couple of my own employees in our marketing department to develop those ideas and work with the realistic nature of them. Ultimately, we have a lot of fun during this process and try to keep it focused on user experience. We incentivize our people to not just pay attention to what they do, but to keep their eye on our industry. We are inspired by the opportunity to build something new and make a positive impact on our environment and people’s lives. SC: What can attendees expect from your KBIS presence? Any themes/campaigns/etc. we should know about? Who are you expecting to reach? BE: We have a new take on our brand that will be completely unveiled at KBIS 2018. There’s been a lot of work going into this for the last eight or nine months, and it’s something that’s been on our brains for well over a year. Ultimately, you’re going to see Niagara really zero in on conservation, not in just the products we make, but in the way we talk and walk. These are things we’ve been doing internally, but we want to put it out there in the proper way so we can not only differentiate ourselves from our competition, but to our customers so they can care about the problems that aren’t necessarily spoken about every day. SC: Are there any standout projects/case studies that Niagara is currently highlighting that you’d like to share? BE: We had recent success with an air force base’s military housing. We saw savings of 50 percent just from replacing its current products with Niagara fixtures. This was a huge project for us — roughly 700 housing units. That’s a lot of water and dollars going into it; it’s ultimately tax payer money that’s going to better use. SC: Is there anything currently happening at Niagara overall that you’d like to highlight? Any awards, milestones, transitions that reflect your current commitment in the industry? BE: We were recently awarded with a 2017 WaterSense Excellence award. We have been in business officially for 40 years. It was great to get to a point that captures all the work we’ve done. Our CEO accepted the award. It was a great moment. In addition to that, there were other winners we worked closely with that got a pretty big callout. Home Depot won WaterSense Partner of the Year, which takes in account work that we’ve done with them. It’s not about glorifying ourselves; it’s about getting everyone to be on par with one another. It’s nice to see them succeed. SC: Niagara has been a water conservationist since “before it was cool.” Now that it’s “cool” how will the company continue to establish its message or reinvent itself? BE: We’ve gone through evolutions left and right, and we’ve always stayed true to our conservation mentality. We found a way to really bring that to a forefront, that we feel hits home with exactly what we’re trying to do and what everyone here at Niagara thinks about and cares about. I wouldn’t say we are “reinventing” ourselves. It’s more about clearing our vision and owning our space. KBIS will play as our official launch of this new look and brand, which you will see moving into the rest of 2018.